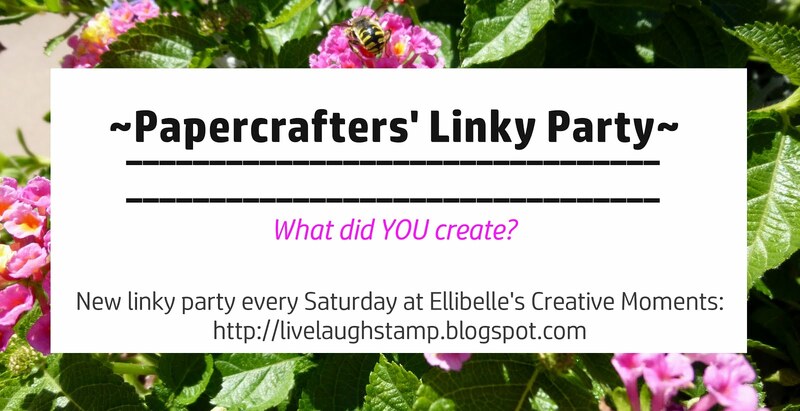 For Papercrafters' Linky Party (anything goes theme) please click here. The linky below is for the monthly themed challenge - Ellibelle's Crafty Wednesday. 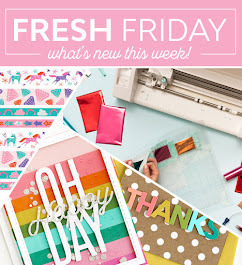 Hello and welcome to Ellibelle's Crafty Wednesday! I'm so excited to add this fun feature to my blog! This will be a monthly challenge, posted the first Wednesday of each month right here on my blog! 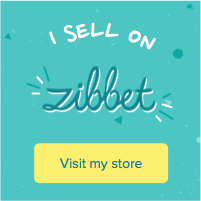 I will try to have a little prize every month for you to win. This month's prize is listed at the bottom of this post. A new theme will post the first Wednesday of each month. Combine with any other challenges. 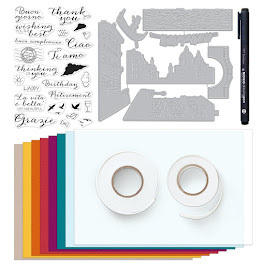 Although this blog is mainly about papercrafting, feel free to create and share other crafts as well, just be sure to follow the monthly theme. This should be an easy one, and I can't wait to see your creations. For my card today I used a cute stamp from the set Garden Critters by Penny Black. The bunny has been heat embossed on Bristol Vellum paper and then watercolored with my Zig Clean Color brush pens before fussy cutting. Sentiment is an older wood mounted stamp also by Penny Black and I used Penny Black's newest Frames Die set from the Sweet Spring release. If you're interested in this die set, I currently have it available in my Etsy shop along with some other newly released stamps. The white card stock is Neenah Classic LINEN textured card stock (80lb weight), and my card base is Stampin Up's Crumb Cake card stock. I used a corner rounder on the bottom parts of the card. The little coral flower is from the same Frames Die set and I used a "candy dot" from Stampin Up in the flower center. Some Burlap string finishes off the card. A little bit of Wink of Stella glitter has also been added but as usual it doesn't show up well in photos. 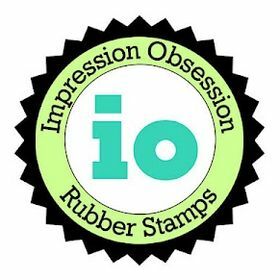 This month I am giving away a cute stamp which I grabbed from my Etsy shop. The winner will be posted here with the following challenge, which will be the first Wednesday of next month. Please note, it will be the winner's responsibility to contact me in order to claim the prize within 2 weeks of announcement. If no contact is made, prize will be lost and used in another drawing. To help you remember to check back, you can follow my blog through blogger's followers option, bloglovin, by email or maybe twitter...whichever option is easiest for you to use. You can find the "follow" info on my side bar or the top of my blog (blogger follower button). (I'm sorry I have no idea why some show up in a smaller font and some regular - no matter what I try, I don't seem to be able to fix this ... it keeps switching back to a small font.) This seems fixed now for the most part...blogger can be a pain sometimes! To join in my challenge simply use the linky tool below. This challenge will be open until Friday March 30th, and a new challenge will post on April 4th along with the March winner. Loving this theme and your card is ADORABLE!! LOVING that bunny!!!!!!!!!!!!!! Happy Easter - what an adorable cute card. Thanks so much for stopping by at my blog and sending me your way. Your bunny card is so cute!! I'm happy to have found you. I will have to sign up to follow you :). What a cute Easter card! I've been so lazy this week. I should have been making Easter cards, but never got around to it. Thanks for inspiring me! Thank you so much fo your kind words on my MM kitty card and for inviting me to join your challenge! This theme is right up my alley! I love animals! Your bunny card is adorable! Love the spring theme! Also love how you framed the sentiment - so cute! Must remember to try this myself! Your prize is awesome and purr-fect for a cat fanatic like me! Happy crafting! A real cute easter card. I like this cute bunny. Wonderful job! such a cute bunny card, ellie, love the dies and the cute sentiment! Oh this is so very cute! I love the frame and the sweet bunny! Very nice done! You've created such a beautiful card to inspire us, such an adorable image. Another cutie Ellibelle...so glad you share your love of PB stamps! So great theme for challenge! Thank you for amazing inspiration!